Charge: 1. Violation of Laws and Customs of War - did, at Prisoner of War Camp No. 17-B, Omuta, Fukuoka, Kyushu, Japan, between Aug. 1, 1943 and May 31, 1944, wilfully and unlawfully commit cruel and brutal atrocities and other offenses against certain POW, and did unlawfully disregard and fail to restrain and control members of his command from committing atrocities and other offenses against POW. Reviewing Authority's Recommendations: The Judge Advocate found that there was nothing shown to "indicate that the accused was authorized even by his own government to impose or execute the death penalty on anyone, and he affirmatively showed that in neither instance were there circumstances upon which to predicate the conclusion of justifiable homicide." Defense Arguments: 1. Superior Orders - had direct order not to follow Geneva Convention rules 2. 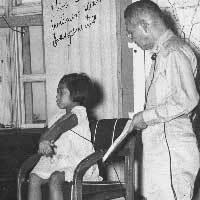 Treated POWs as Japanese soldiers are treated 3. No authority to punish his guards, but reported offenses to superiors.